Fleeing from Nazi persecution and World War II, Martín Blaszko was forced to immigrate first to Poland (1933), then France (1938), and finally to Argentina (1939). In 1945, he met the artist Carmelo Arden Quin, whose abstract-rational language captivated him, and a year later, along with Arden Quin, Gyula Kosice, and Rhod Rothfuss, he founded the Madí movement. In 1947, following in the steps of Arden Quin, he broke up with the group. Using the compass as his main drawing tool and the golden section as the concept determining all relations, Blaszko, following the Madí movement’s principles, created geometric paintings with irregular frames and vertical format. From these, and as a natural consequence of his study of verticality, evolved his sculptural production of monolithic pieces. In these sculptures he often showed the concept of “bipolarity,” an expression of two antagonistic forces represented by ascending bodies that were crossed, interrupted or converged. This confluence and tension gave rhythm and balance to the sculptures’ composition. The evolution of these ideas led to more open, dynamic, and lighter works. 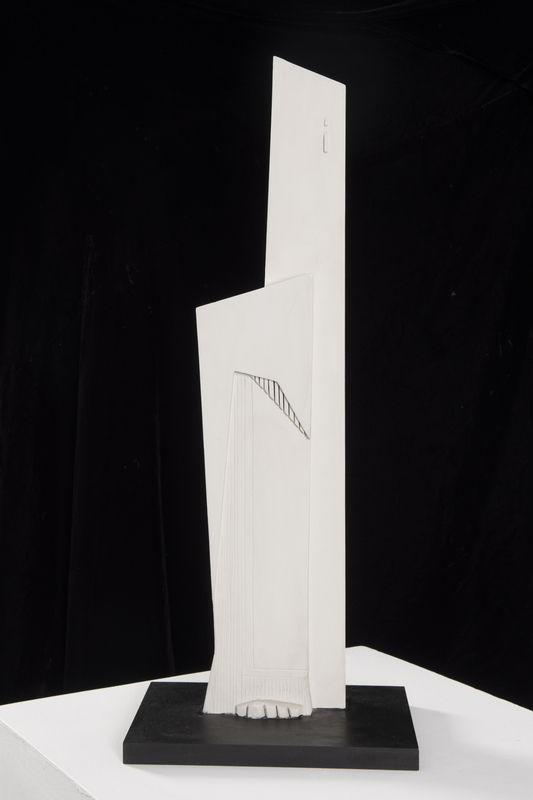 In 1952, Blaszko participated in The Unknown Political Prisoner International Sculpture Competition (awarded by the Institute of Contemporary Art of London) and, as a finalist, he was selected to exhibit at the Tate Gallery (London, 1953). His retrospective exhibition in 1961, 15 años de escultura, established him as one of the most original Argentine sculptors of his time. During the 1960s and 1970s, in series like Joys and Constellations (initiated in previous decades), Blaszko experimented with textures and expressive forms, beginning a new stage that was influenced by informalist and expressionist art. Using mainly rough surfaced bronze and working with the effects of light and shadow, the sculptures of this period were massive and irregular. Since the end of the 1980s, Blaszko’s work has been characterized by assembly of painted aluminum planes. They are dynamic and light as in his earlier work. Although Blaszko’s works had a monumental it was not until the 80’s that he produced works for public spaces. Among them are Jubilo (Parque Centenario, Buenos Aires, 1986) and El canto del pájaro (Japan, 1991). In the 1990s and the beginning of the twenty-first century, Blaszko began to use oil paint and collage to explore the relationships between color planes.